In the ‘what’s not to like about wind power?’ category, here’s a story from Ontario: the Canadian province that its loony-green-left Government has turned into a pin-cushion, sporting thousands of these things that have destroyed entire rural communites. Now, it’s their precious underground water supplies that are being destroyed by wind turbine generated vibrations. CHATHAM-KENT, Ont. — Vibrations from wind turbines, a phenomena known as seismic coupling, is being blamed for sedimentation in more than 20 water wells in this southwestern Ontario municipality. More than 460 rural residents have signed a petition, which was presented to the municipal council Aug. 22, asking for a moratorium on further development. Thousands of dollars have been raised to help Kevin Jakubec make an appeal to halt the latest wind farm, approved June 29 under Ontario’s Green Energy Act. “We are not backing down. There comes a point where the rural community draws a line, and that line is the North Kent Wind One project,” Jakubec said. Hundreds of turbines are located in Chatham-Kent, one of the largest concentrations in North America. The controversy concerns those in the former Township of Dover just east of Lake St. Clair and a new project, North Kent Wind One, headed by Pattern Energy and Samsung Renewable Energy. Jakubec said developers were informed of the concern at a public meeting last November but have yet to respond. Ontario’s Ministry of Environment and Climate Change has acknowledged there may be concern. Under the Renewable Energy Approval, Pattern and Samsung are to test well water if residents complain, offer an opinion as to whether turbines are to blame, and supply bottled water until the issue is resolved. A spokesperson with Pattern Energy said his company is willing address concerns from the public but would not answer any questions at this point due to the pending environmental hearing. Jakubec said the requirements are inadequate and do not address well water concerns near wind developments already in operation. He and members of the citizen’s group Water Wells First, want the new development stopped and have other turbines fixed or shut down until groundwater issues are addressed. “There’s a total disconnect here to rural people. They don’t understand the implications for their quality of life,” Jakubec said. Resident Mark St. Pierre told the Chatham-Kent council that his problems began nine years ago with the construction of a wind farm near his home. He drilled a new well thinking that his old well had passed its useful life, but with the construction of additional turbines near his home the problem returned. Jakubec said well water issues are often first noticed when piles are driven into the earth to anchor the giant machines. In some instances, problems clear up but in others they continue. There have even been cases of turbidity levels fluctuating in relationship to the direction and intensity of the wind. 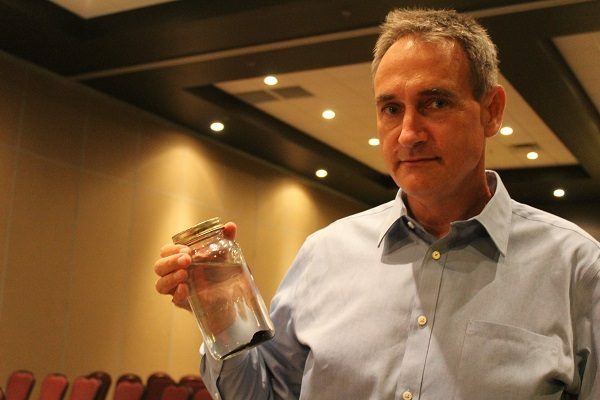 Longtime well driller Ken Wade of Port Lambton has been working with Jakubec and informed the Ontario Ground Water Association (OGWA) of the issue. Wade said turbidity problems should come as no surprise. The same phenomenon has occurred as the result of earthquakes, oil and gas exploratory work and even thunderstorms, he said. Wade said turbines can be retrofitted to dampen vibrations and alternative anchoring systems are available, but those would cost more. 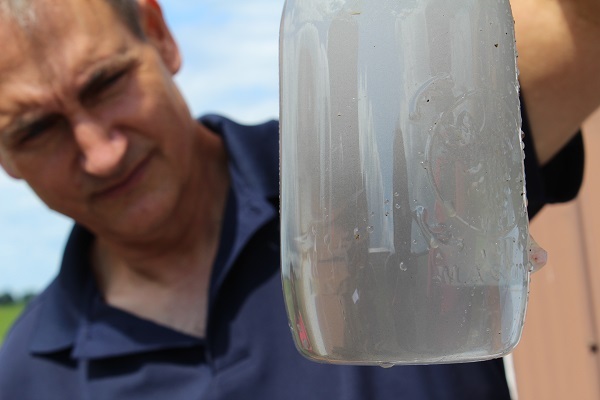 The water table is fragile in Dover, part of a geological area stretching from Lake Huron to Chatham-Kent. There are just 50 to 70 feet of overburden in most places covering black shale bedrock. Wade said it’s often difficult to find water and when it is found the flow is often low. Jakubec and Craig Stainton, executive director of the OGWA, said the approval process appears stacked against landowners. Once a Renewable Energy Approval is granted, there’s only 15 days to appeal and it’s up to the appellant to prove a risk to human health or the environment. It’s also a costly process. Jakubec said at least $200,000 is needed to pay for the legal fees and expert opinions. Jakubec and Stainton said there are studies from Scotland and Italy that have identified seismic coupling. Jakubec, a green energy researcher, said impacts tend to be felt from 1.5 to five kilometres away from turbine locations. It’s an ironic situation, Jakubec said. While wind energy is often viewed in a favourable light, in Chatham-Kent it has had a negative impact on the aquifer. I started a PETITION “SA PREMIER JAY WEATHERILL : Demand the RESIGNATION of the Energy Minister for HIGH POWER PRICES CAUSING SA’s JOBS CRISIS and 15,000 household POWER DISCONNECTIONS, frequent POWER BLACKOUTS and the JULY 2016 POWER CRISIS” and wanted to see if you could help by adding your name. Our goal is to reach 100 signatures and we need more support. Please share this petition with anyone you think may be interested in signing it. I have said for sometime this could happen. It was poo pooed when I brought it up in respect to the Allendale East project- thank goodness for Richard Paltridge who stopped this project. I also mentioned the possibility of such damage in a submission re the Ceres project on Yorke Peninsular. It is something that should be highlighted for all those turbines proposed and approved for Western Victoria, areas which have a reliance on ground water which in many cases is close to the surface. Nothing about these things is good nothing good comes from them. Aquifer destruction is a consequence of wind power development. In places where shallow wells and cisterns collect drinking water, this can be drastically changed so that runoffs become sudden and streams and creeks go dry. In affected areas of Ontario, water supply and quality is impacted. Many developers in wooded areas shred the tree and shrub materials and spread them around the ground around the turbines. While this may help to control weed and scrub growth, it begins to rot, forming phenolic sludge flows that threaten rainwater runoff into the ground water. This fouling is further added to by the burial of large numbers of birds, killed by the wind turbine blades, in pits near the turbines. Rainwater and snow-melt draining through this decomposing mass can be contaminated with salmonella and typhoid causing bacteria. All and all, a toxic water cocktail can replace what had been good drinking water. This is a threat to rural existence.